Each year, we look forward to the time when we can plant cool season herbs into our gardens. Dill, fennel and cilantro are just a few of our favorites. The great thing about cool season herbs is that they are all also very beautiful. You can mix these culinary favorites into colorful wintry planters along with cool season annuals and other edibles. Cut sprigs to add to floral arrangements and centerpieces. Not only will these easy-to-grow herbs weather the winter, but they’ll also provide you harvest now through late-spring. Parsley. While parsley is a tried and true culinary herb, you may not realize how pretty it is in the garden. 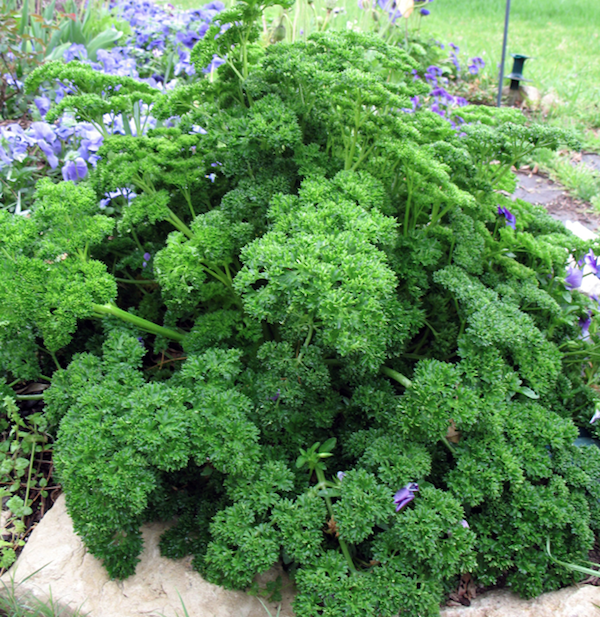 You’ll often find two types of parsley in the garden center; either flat-leafed or curly. Both are beautiful plants, but we find the curly parsley is a real showstopper in the winter landscape. It’s bright emerald green foliage is the perfect backdrop for pansies, violas and Iceland poppies. Fennel. Braised fennel bulbs are quite the culinary delicacy. But it’s the airy, feathery foliage of fennel that really puts on a show in the garden. You’ll find fennel in either bright green or bronze foliage color. Bronze fennel is quite beautiful when paired with bright green parsley. Plants put on large umbel shaped flowers come spring. When it comes to flavor, if you love licorice, you’ll love fennel. Arugula. Nutty, spicy, peppery all describe this salad favorite. Arugula makes a wonderful leafy green border in garden beds. Plants can easily be seeded into ornamental or vegetable beds. Pair with calendula and violas for a bright cheery combination. As a bonus, you’ll have an endless supply of this expensive salad mix through winter and into early spring. Dill. This garden favorite has not only wonderful flavor and fragrance, but attracts butterflies in spring and summer. Like fennel, it’s feathery foliage adds beautiful texture to the winter garden. Swallowtail caterpillars will feed on dill in spring so be sure to plant a few extra for them. You can allow plants to go to seed in spring and save the seed for fall. Cilantro. Ideally, cilantro should grow alongside our tomatoes and peppers so we could make the perfect salsa. Sadly, cilantro just can’t take our summer heat! So, we’re left to grow this beautiful herb through the winter months. Plant cilantro as early as possible in the fall season for the longest harvest. Once the weather begins to warm, cilantro will bolt and go to flower, which gives its normally delicately flavored leaves a bitter taste. You can cut spring flowers for flower arrangements indoors. While these are a few of our favorites, know that there are many more herbs that thrive through winter in the Houston area. Thyme, nasturtium, rosemary and oregano are all excellent choices for containers, and garden borders. Before planting herbs, be sure you amend your soil with compost to improve drainage. Learn more about why healthy soil is so important in our previous blog. Herbs will appreciate a feeding each month with a quality organic fertilizer. Remember, if you plan on consuming your herbs, you’ll want to avoid synthetic fertilizer and water weekly through the cooler months. Questions about how to incorporate herbs and other edibles into your landscape? Visit us on Facebook and now on Twitter (@malivingexpress).